Els and Ron surprised me by taking me beach sailing or “strandzeiling” in Dutch. It was their first time to try it too. It must have been a good day for it because the beach near Ouddorp was humming with activity! It felt very different than two years ago when Tante Els took me earlier in the year and the beach was as almost deserted and we saw only one person kite-buggying. I learned that beach sailing is when the buggy is attached to a sail on a pole and kite buggying is when the buggy is pulled by a person holding a large moon-shaped kite. 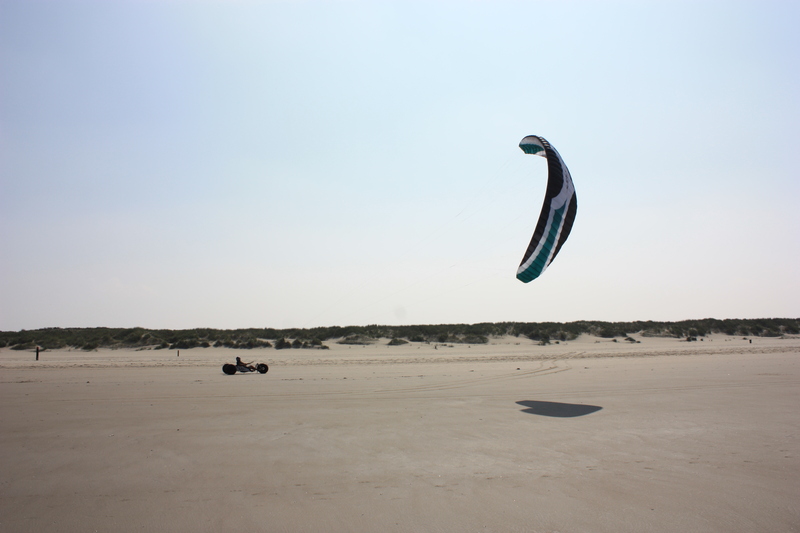 Kite buggying is more complicated but can be done in lighter winds, whereas beach sailing requires higher winds but is easier for beginners. We were taught by instructors and it was way easier than I thought it would be. You simply steer with your feet and control your speed by tightening or loosening a single rope that pulls the sail taught or lets it go. The biggest challenge is to pay attention and always know where the wind is coming from. That task was made easy for us as our instructor had us drive between two pylons. It was important which way we turned around each of the pylons in order to catch the wind in the turn. I’m guessing this is something that you would eventually get the feeling for with practice. We took turns in the buggies so that there was someone to push at either end in case someone got stuck in the turn! At first the wind was strong and sometimes you could even feel a rear wheel lift when making a turn (I loved that feeling! ), but later on the wind slowed down and we had to stop a bit early. I enjoyed beach sailing and hope I will get the chance to do it again (I would like to try regular sailing too)! On our way home we stopped for tea at my Oma and Opas. Then we headed back to Ron and Els’s and Opa and Oma came a few hours later for dinner the second day in a row. I feel so blessed to have been able to stop in and visit my family every year or so for the last several years! Upon arriving at Schipol Airport I took the train to Rotterdam. I had arranged to stay with my cousin Geertien for the first night in the Netherlands. I found my way right to her house which is in the city proper. Oh how I love how easy it is to get around the Netherlands without a car! The flight was a red eye and so I was running on only a few hours of fitful sleep! 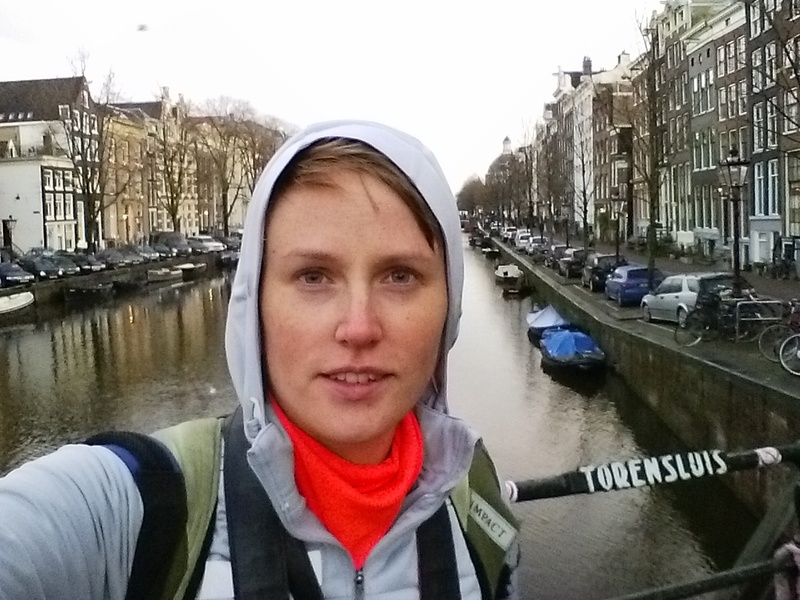 I enjoyed breakfast with Geertien, cleaned up, did some research to decide what I wanted to see, and then Geertien generously offered to take me to see some of the places I had on my list. I also asked her to take me to one of her favourite neighbourhoods! 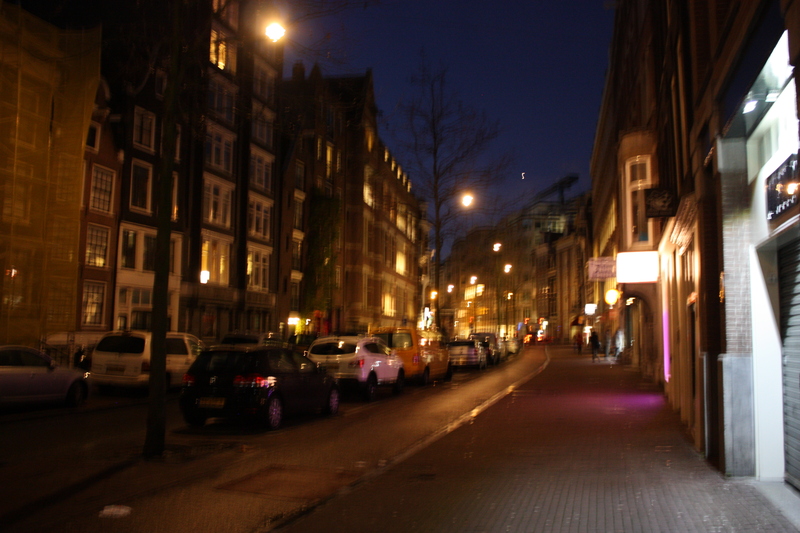 It was fun to experience Rotterdam by car. First we drove down to the center and visited the Markthal by MVRDV and then went to the Central Library across the street so that we could get a view of the square. I can’t decide what I think about the area. In one way I like it because it is an architectural laboratory of creativity and experimentation, but at the same time I wish that the designs were less alien and responded more to one another! Because each building is so self-focused, the space in between feels very accidental and without meaning. Next we walked to Timmerhuis that was designed by OMA. I thought this building responded well to the surroundings and has a form and facade that are beautiful but not overdone. 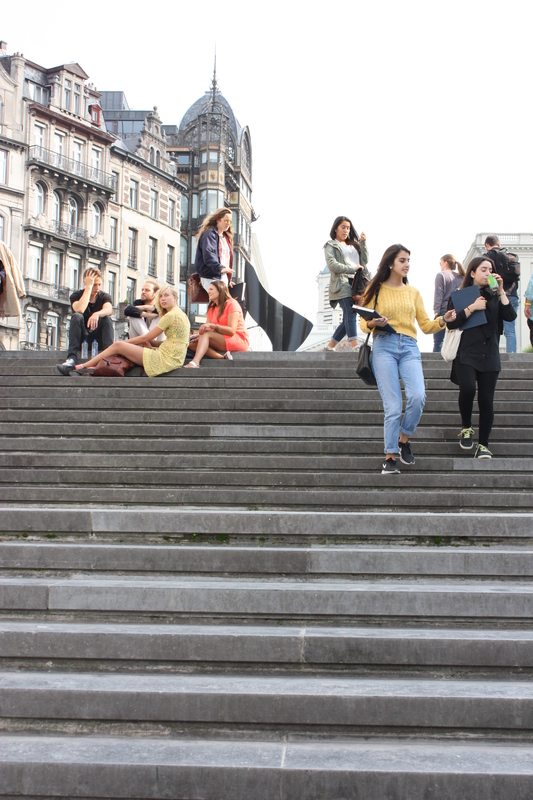 Lastly we went to the Luchtsingel bridge that is an urban infrastructure project that was crowd-sourced and provides a backdoor access that connects three or four converging neighbourhoods while reinvigorating what was a more deserted, “sketchy” area. We met a man on the bridge who could tell we were tourists and wanted to know what we thought of the project. He used to work at the city and we learned from him that the project was quite controversial. From there we walked back to the car and Geertien brought us to the riverfront where we could get a good view of the Erasmusbrug. Beside it is another building by OMA called De Rotterdam. It is part of the redevelopment of the old harbour district on the southern side of the river. By then I was beginning to fade, but still wanted Geertien to bring me to one of her favourite neighbourhoods where a lot of Turkish immigrants live. It is a place where she has been engaged in community projects as a social worker, and she shared with me about a community project that was recently completed to transform an old church into much needed housing for Turkish girls in the community. I really liked the look and feel of the place, and think it is a great thing when a community takes it in their own hands to improve their neighbourhood. 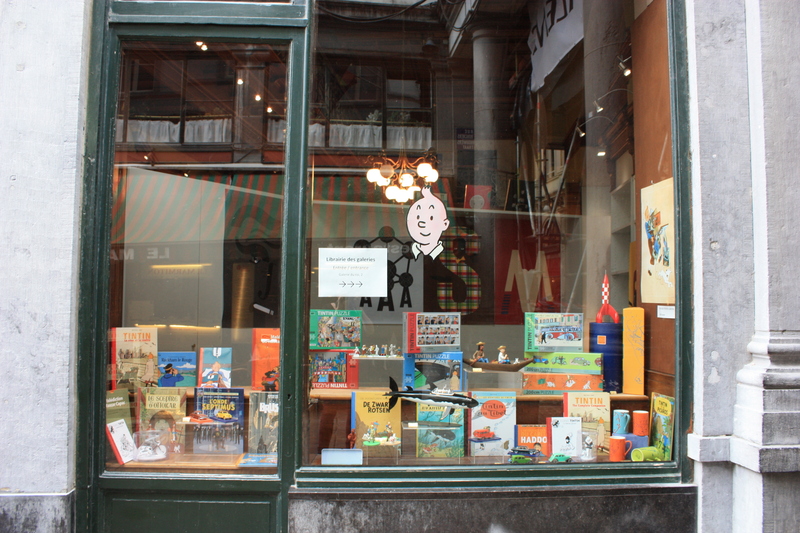 The following day I took the metro and wandered around Rotterdam on my own. I brought my bags with me and put them in a locker at Rotterdam Centraal so that after exploring I could head to my next destination that was my aunt’s place in Middelharnis. To get there I had to take the metro and then the bus. Again, I found my way to her house and as I walked up I could see Tante Els, Ron, and my Oma and Opa sitting down to dinner! It was wonderful to see them all again! Els informed me that she and Ron had something special in store for me the following day! We were going to try an activity called beach sailing! 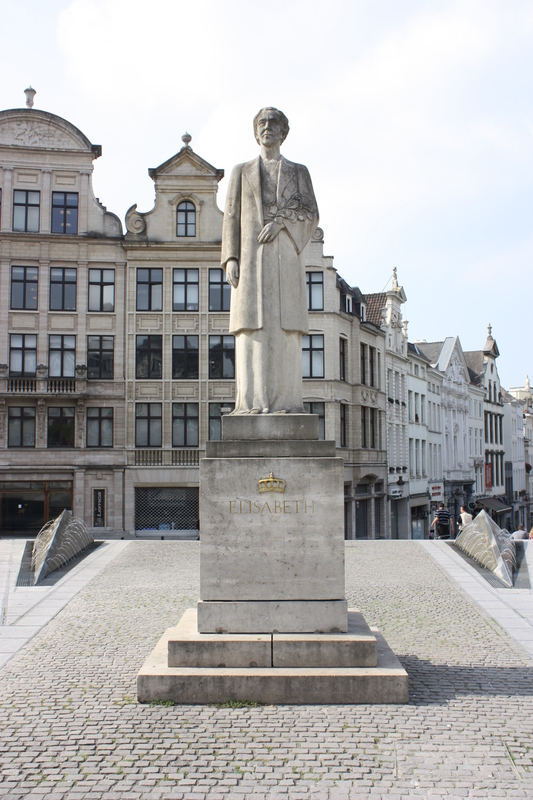 Stéphanie lives an hour outside of Brussels in Louvain-la-Neuve. It is very much a student town that is only forty years old. It is an interesting town because it was built on top of a valley and so the cars drive beneath the city center. The whole city center is pedestrian and the academic buildings are mixed with shops and restaurants. 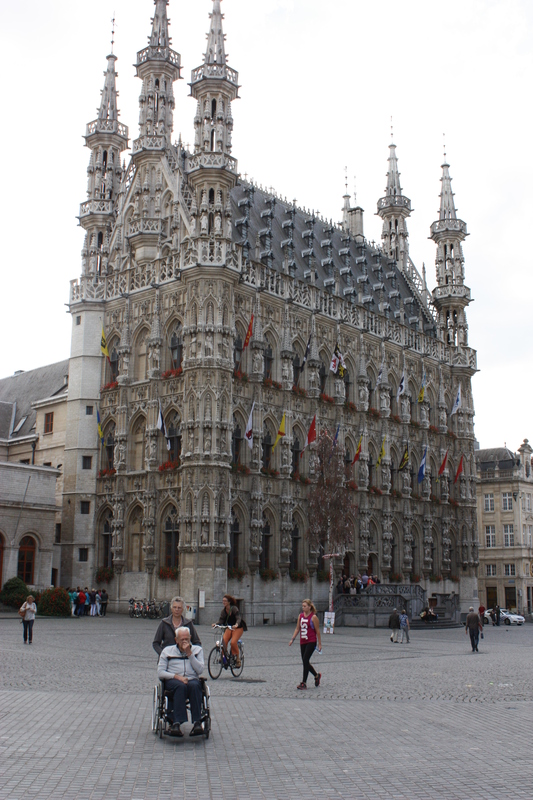 Since Stephanie had to work during the days, I took one of the afternoons to visit the town of Leuven. 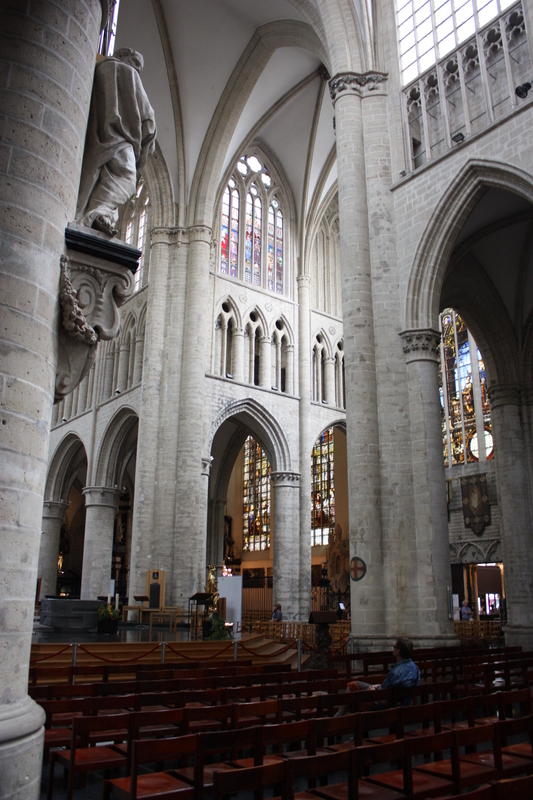 Stephanie had recommended I visit the town of Bruges, Leuven, and Nider, but I had to be content to visit only one because I wanted to stay within my stopover budget. 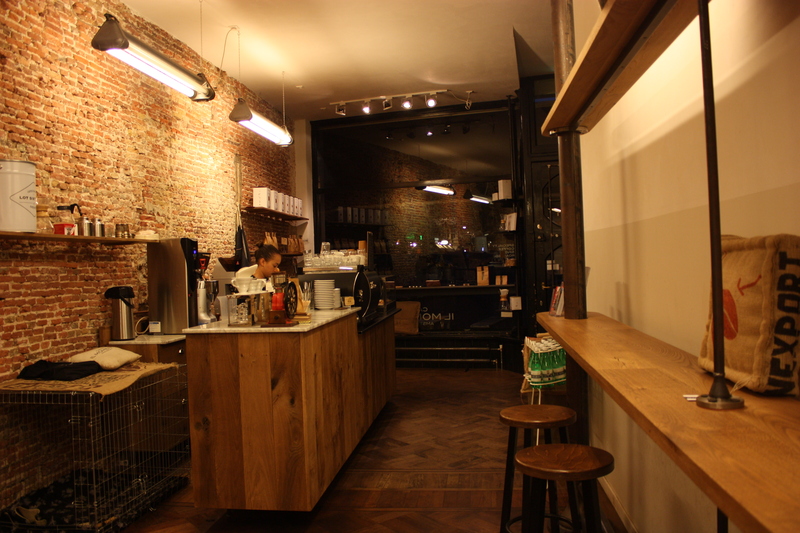 Leuven is a really nice city. 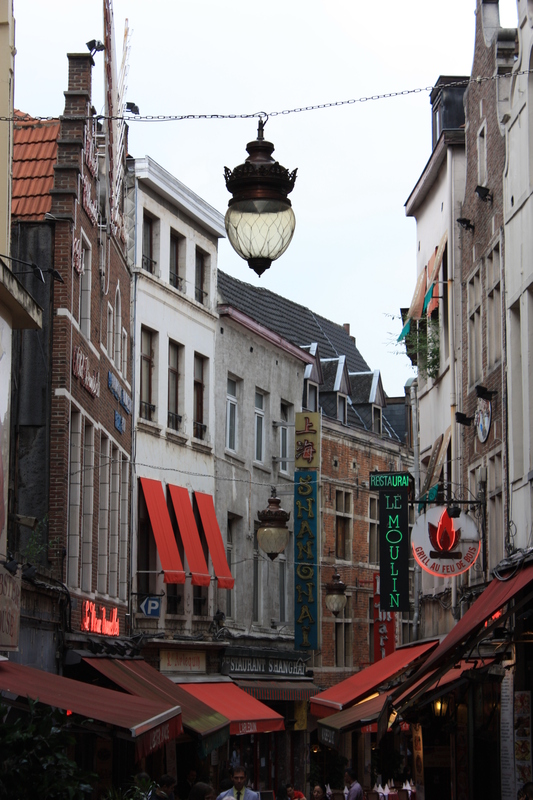 It is smaller than Brussels but has wonderful historic buildings. It is also a university town that had a vibrant energy. I was confused at first because I thought Louvain and Leuven where different places, but one is just the french spelling and the other the flemish way. 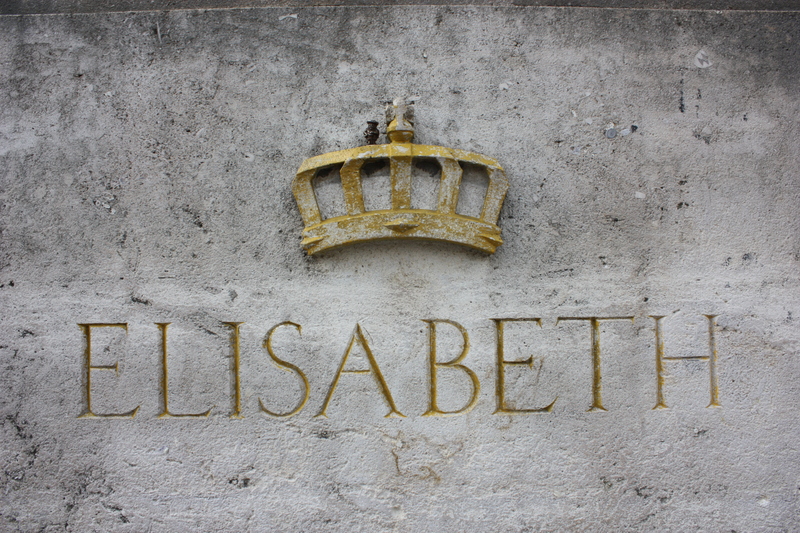 Supposedly the university used to be flemish and french until they had conflict and split up. 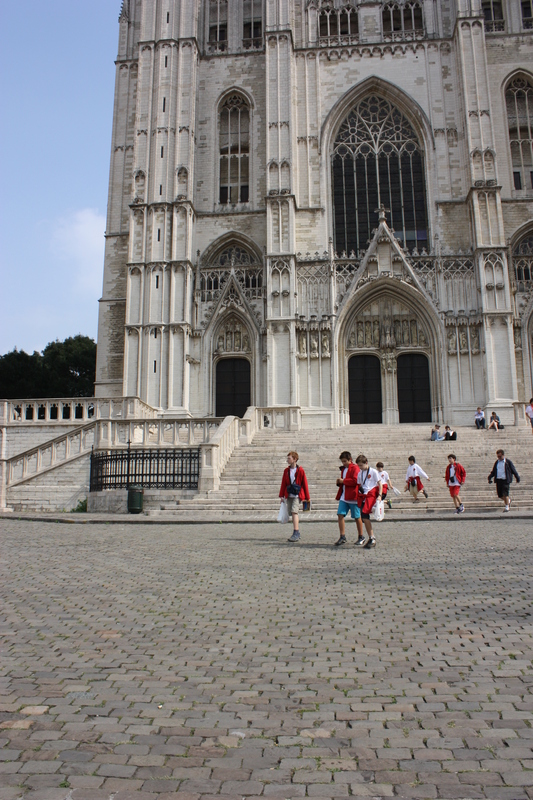 The french part moved out and built what is now Louvain-la-Neuve (the New). The first evening I went to choir practice with Stephanie and the next night to have dinner with her family to celebrate her sister’s birthday. I didn’t mind the social interaction because I was happy to have the chance to practice my french before moving on to african french. Les amies et la famille de Stephanie étaient sympa! The next person on my itinerary to visit was Stéphanie who I also know from my exchange in Lausanne. 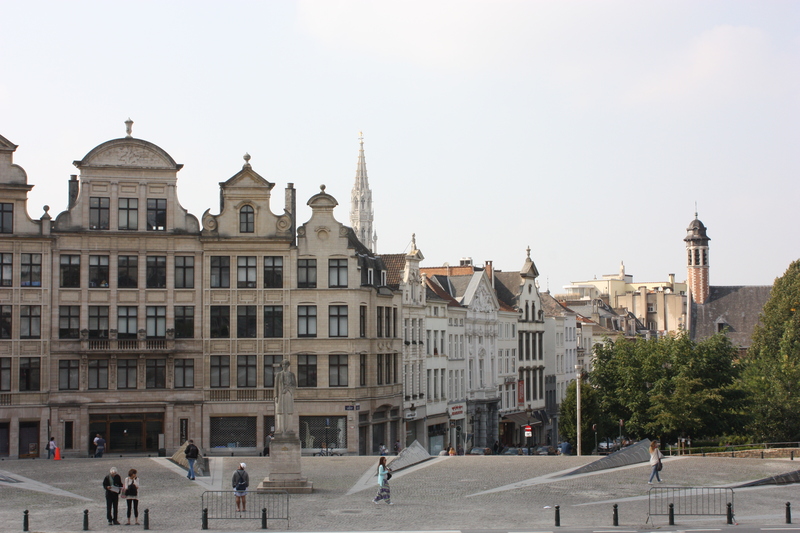 Because she wasn’t free until the evening, I decided to arrive early in Brussels, store my bags in a locker for the day, and head out and see some of the city. It was fun to test out my new camera and experiment with more of the settings! From the station I headed toward some spires I saw in the distance and found la grande place where the town hall and the museum are located. There I found an information table and got a map of the city. I decided to follow a path that the map suggested for seeing Art Nouveau architecture. It was a nice way to explore since I really didn’t do any research of the city in advance. 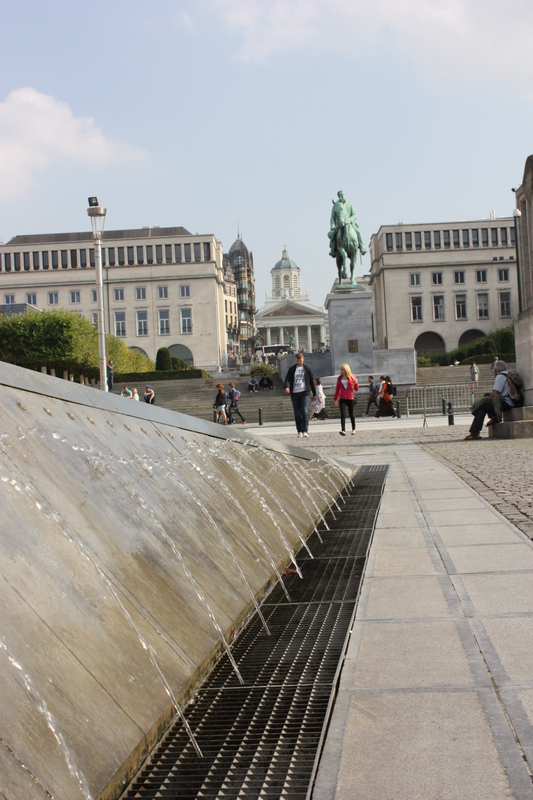 My favourite place was the Place d’Albertine because it had an interesting fountain, the statue of the Belgian queen Elisabeth, steps to chill out on, and really nice views. From the 5th to the 6th I stayed in Rotterdam with my friend Anne who I know from my exchange in Switzerland four years ago. We went to the Beergarden with her boyfriend and another friend and had a nice time catching up. The next morning I slept in until eleven (jetlag + stress) and so sadly we didn’t have as much of the day as I would have hoped. We had a nice brunch, walked around some of the shopping areas, and then it was time for me to head to Ede. They kindly drove me all the way there so that I didn’t have to take the train! 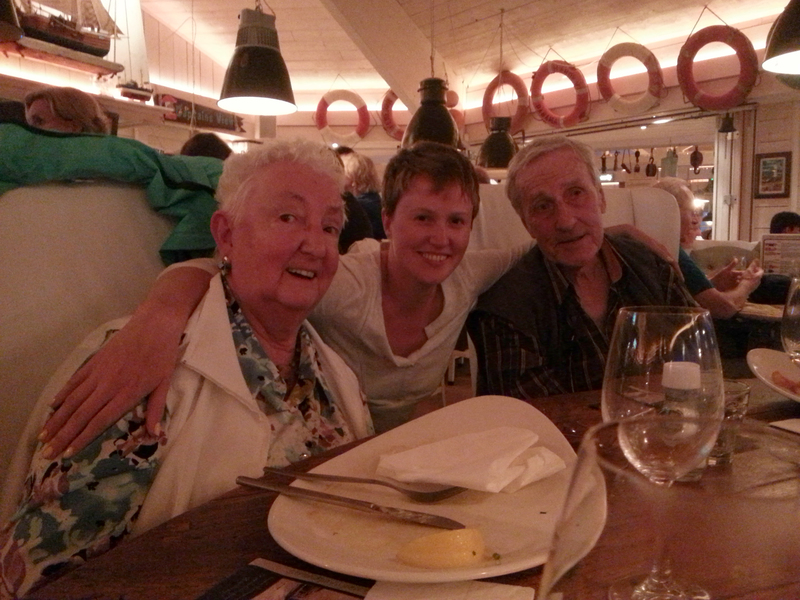 I didn’t stay long in Ede because Jacques and Gesina had arranged for me to stay at the Bulsink family reunion. It so happened that I timed my visit very well! We went to a park area where the family had rented a bunkhouse for the weekend. There were a few familiar faces and many unfamiliar faces. I already knew many people from their visits to Canada: the Koelmans, the van Zwets, the Bulsinks, and of course the Ploegers. I met tante Jo for the first time and told her that I was the granddaughter of her sister Jannie. 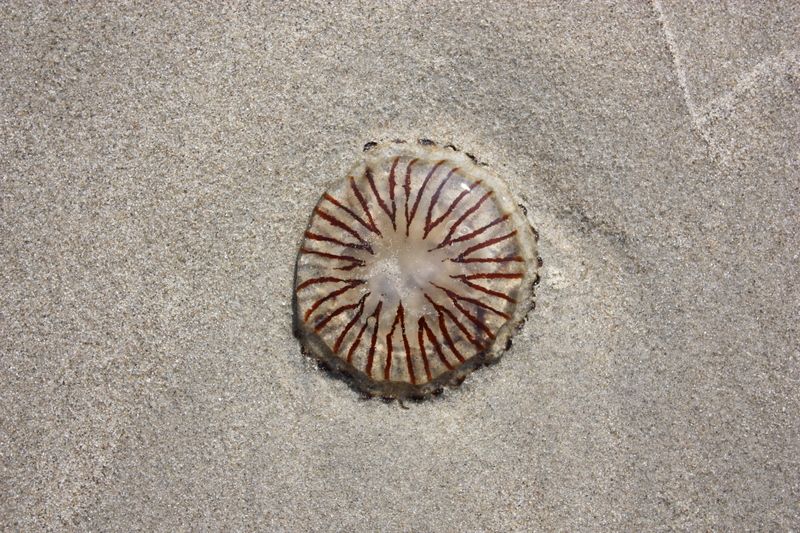 I definitely see the resemblance between all of the Wikkerinks near and far. They had a whole bunch of photo albums to look through. That evening there was a crazy game prepared that involved us teaming up into groups of three or four, running around looking for numbers that were taped all over the place both inside and outside, and performing funny tasks and games. I was on a team with Gemma and her boyfriend and we had to do things like tie our wrists together for the rest of the game, hang a string with a nail from our rear end and try to get it into a beer bottle, and make a joker out of craft materials. I learned that there was something called Bulsink Rules which actually means that most people break the rules! Canadian Wikkerinks beware! This game is coming to you next year! The next day was very relaxing. We mostly just socialized and played games. I enjoyed playing several rounds of Wizard. I learned that it is Bulsink tradition to go and have pancakes on the last day. Instead of eating out they hired Bram’s Pannenkoeken to come with his bike cart to make them for us right there! There were the options of naturel, appel, kaas, spec, or any combination! I offered up a bottle of Canadian maple syrop for everyone to enjoy. It was a memorable weekend. If any Bulsinks read this and have any good photos, please send them my way! On Sunday evening I had a change of plans and stayed with my cousin Margreet (daughter of Geerteit) who I had just met that weekend. She and her two boys hosted me at their home in Breda. 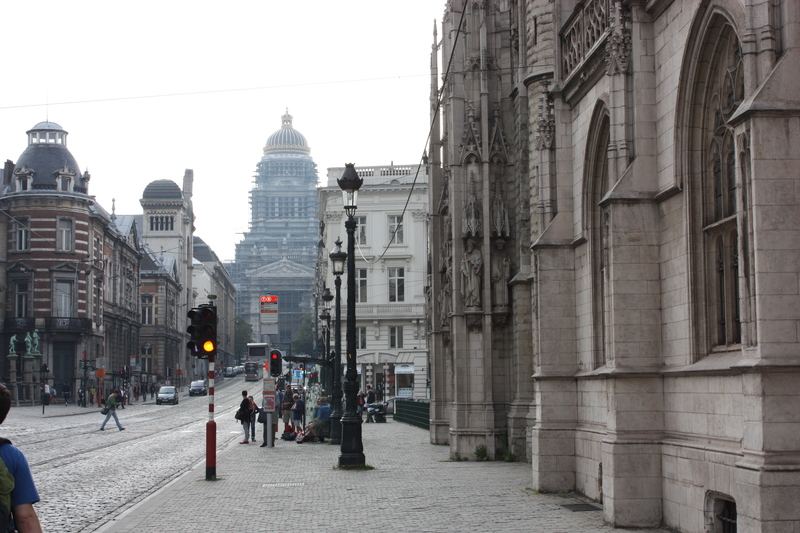 It worked out well because the next stop on my journey was to be Brussels and so I was already quite far south. 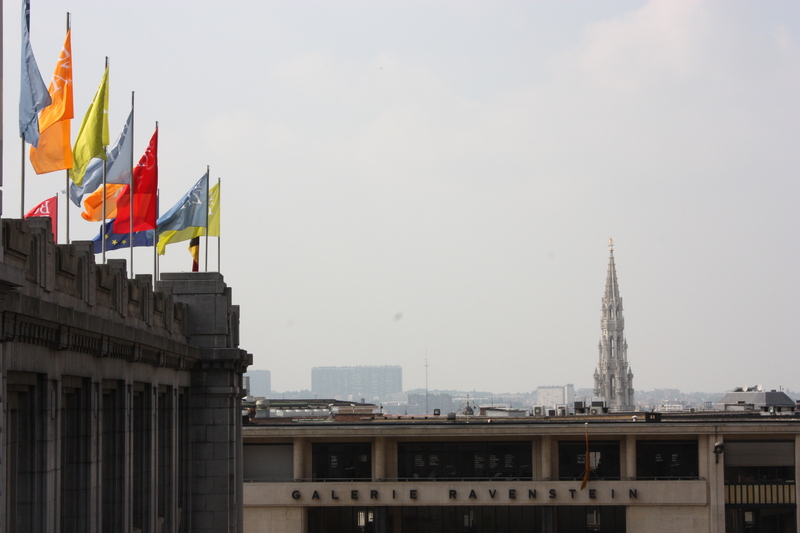 The next day it was a simple trainride from Breda to Roosendaal and then Roosendaal to Brussels Centraal. Now it was time to play tourist! For three days I visited my dad’s family in Middelharnis. They live close to the sea and so on one of the days my aunt took me to Ouddorp and we walked along the beach. I enjoyed spending time with my Opa and Oma just sitting having coffee or playing games. On the final day we drove up to Noordwijk to visit my other aunt and uncle and two cousins. 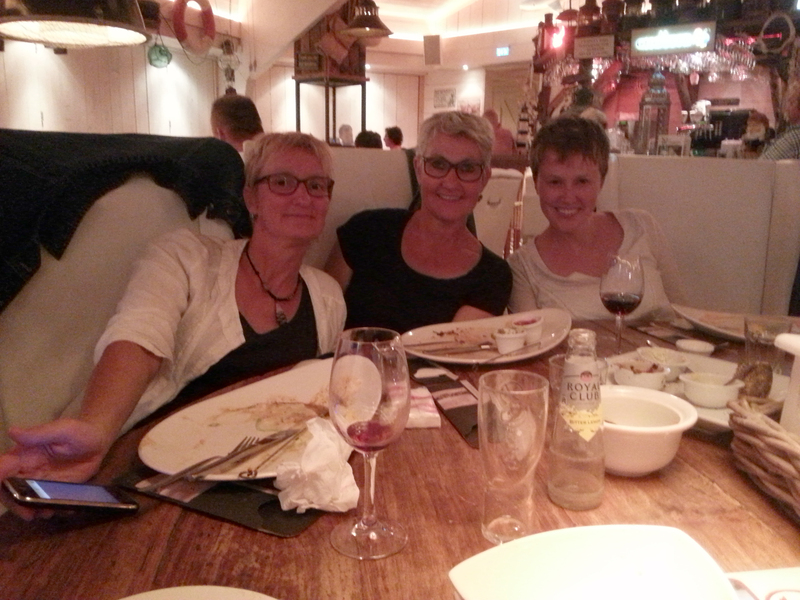 We went to a restaurant called the Zeemeeuw (seagull) and shared a delicious meal! On the way home Els and Ron dropped me off at the Rotterdam Central Station to meet up with my friend Anne from my time in Switzerland. It was a lovely start to my trip! I had a week of holidays between the end of my intensive french course and the beginning of classes, and so I decided to make the trek to the Netherlands to visit friends and family. I took the train in the early morning from Lausanne to Geneva Airport, and from there flew into the Schipol Airport in Amsterdam. 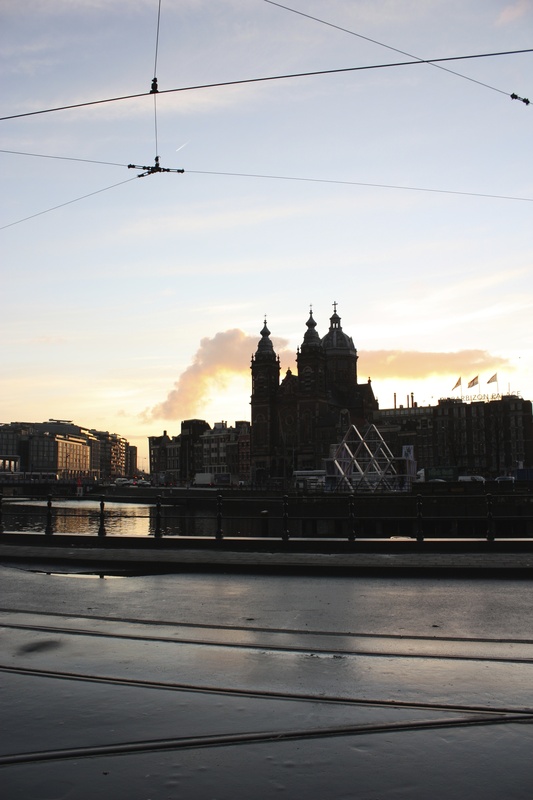 I spent the afternoon in Amsterdam, two days in Ede, one day in Scheveningen, and a final three days in Zeeland. When I was in Ede I went with family to visit the town of Aalten, which was where my grandmother grew up. I got to visit a museum there that honors my great grandfather for his efforts in the the resistance during the second world war. I also visited the little town of Dinxperlo which lies on the border with Germany, and got to straddle the two countries on a street that runs right along it. 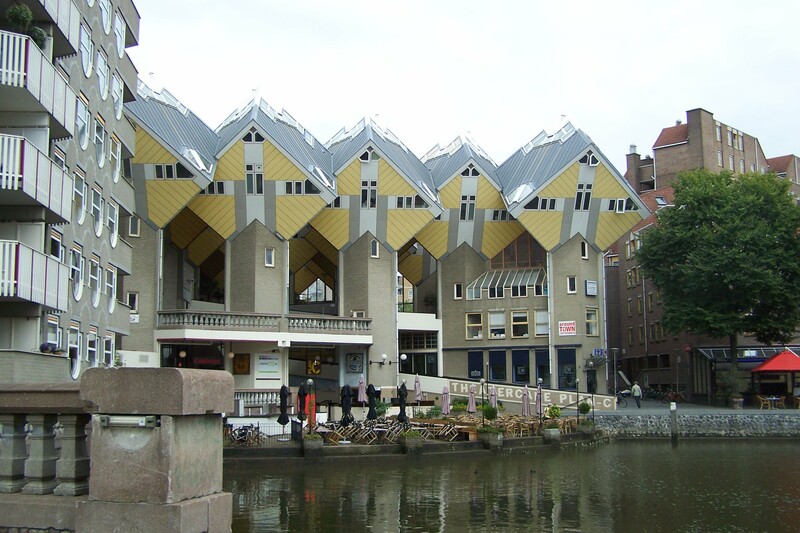 During my time in Zeeland I took a day trip with family to Rotterdam and got to see the Cube houses for the first time by dutch architect Piet Blom. We also went to the Museum Park and got a tour of the Sonneveld house, which is a house in the ‘Nieuwe Bouwen’ style – a dutch branch of functionalism. Designed in the 1930’s by architect Leendert van der Vlugt, it follows many ‘Le Corbusian’ ideas.